Today's post is a quickie but a goodie - it's a small update on one of my first ever posts and the launch of a new mini series all about how to match your shadow to your eye colour. It seems such a silly thing but using the right combination of shadows can really draw attention to your eyes making them look bigger and brighter. And because I was quirkily blessed with a couple of different eye colours I can show you the effect of all sorts of combinations. Lately I've been experimenting with a couple of different palettes trying to incorporate bright, unwearable shadows into everyday trends. This look comes from a subtle twist of the Sleek Garden of Eden Palette (inner corner, outer corner, crease) mixed with a gorgeous smoky grey from the Accessorize Masquerade Palette (mid-lid) to tone it down and make it a lot more wearable and complimentary to both eyes. You can see that the silver mid-lid hues of the shadow appear to make the blue eye cooler and a little smoky bringing out the sea-blue tones. And on the green eye, the deep emerald of the outer corner and crease compliments thee outer iris perfectly, making it pop. 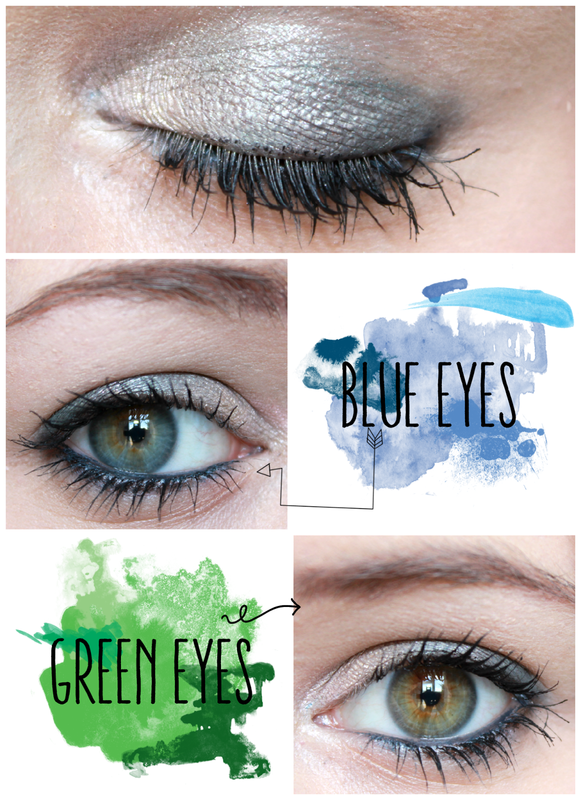 Are there any shadow combinations you'd like me to test out? Comment with your suggestions below!